ww2dbaseAllied aircraft's targeting of all vehicular convoys, war damage to transportation infrastructure, cruelty of the German occupation, and the unusually harsh winter of 1944 to 1945 all contributed to great famine during the winter of 1944 to 1945 in the Netherlands. The suffering was particularly felt in the more densely populated western regions of the country. During the general Hongerwinter ("Hunger winter") period, approximately between Sep 1944 and May 1945, about 18,000 to 22,000 Dutch civilians died due to malnutrition and starvation, with Mar 1945 being the worst month by the number of deaths. ww2dbaseIn Apr 1945, British Prime Minister Winston Churchill and US President Franklin Roosevelt agreed that something needed to be done. Shortly after, US Army Chief of Staff George Marshall gave Dwight Eisenhower the permission to conduct negotiations with Reichskommissar Arthur Seyß-Inquart of the German occupation for a limited ceasefire, through which relief could be brought to the civilians. Due to the negotiations, fighting was de-escalated from 28 Apr 1945 through what would become the end of the European War. It was then agreed that Allied aircraft bringing supplies for the civilians following specific air routes would not be fired upon by German anti-aircraft fire. The first of such missions took place on 29 Apr, and Seyß-Inquart would officially give the order to cease firing on Allied supply transports on 30 Apr. ww2dbaseThe aerial Operation Manna commenced first on 29 Apr 1945, concluding on 7 May 1945. It was conducted by British, Australian, Canadian, New Zealand, and Polish aircraft and crews. During this operation, 3,301 sorties were flown (145 by Mosquito aircraft, 3,156 by Lancaster aircraft), delivering 6,680 tons of food and supplies. The crates were dropped without parachutes at the altitude of approximately 120 to 150 meters (about 400 to 500 feet) to Katwijk (Valkenburg airfield), The Hague (Duindigt horse race course and Ypenburg airfield), Rotterdam (Waalhaven airfield and Kralingse Plas), and Gouda. ww2dbaseThe US aerial counterpart, Operation Chowhound, lasted from 1 May 1945 to 8 May 1945. A total of 2,268 sorties were flown by B-17 Flying Fortress bombers, delivering about 4,000 tons of food, some of which in the form of K-rations. ww2dbaseThe third effort, Operation Faust, began at 0730 hours on 2 May 1945 and ended on 10 May 1945. During this operation, 360 Allied trucks (from 8 Canadian and 4 British transport platoons) conducted multiple round trips, delivering a total of about 9,000 tons of food and supplies to a designated area between the villages of Wageningen and Rhenen in central Netherlands. Logistical problems prevented Faust supplies from being distributed to the civilians in Amsterdam until 10 May 1945, in The Hague until 11 May 1945, and in Utrecht until 11 May 1945, however. While Operation Faust officially concluded on 10 May, 200 Canadian trucks remained on food distribution missions in the Netherlands for some time to come. 23 Apr 1945 George Marshall authorized Dwight Eisenhower to negotiate with the Germans in the Netherlands for a limited ceasefire in order to bring relief to the starving civilians. 29 Apr 1945 Two British RAF Lancaster bombers conducted the first Operation Manna sortie, delivering food to Dutch civilians. 30 Apr 1945 Commissioner of the German occupation in the Netherlands, Arthur Seyß-Inquart, officially agreed that Allied aircraft delivering food and other supplies to Dutch civilians would not be harassed by German defensive fire. 1 May 1945 US B-17 bombers dropped crates of K-rations over Amsterdam Schiphol Airport in the Netherlands. 2 May 1945 At 0730 hours, the first of many Canadian and British trucks crossed German defensive lines in the Netherlands without being harassed to deliver food to Dutch civilians. On the same day, 400 US B-17 bombers dropped crates of K-rations over Amsterdam Schiphol Airport in the Netherlands. 3 May 1945 US B-17 bombers dropped crates of K-rations over Amsterdam Schiphol Airport in the Netherlands. 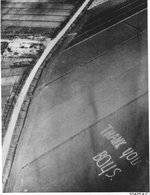 5 May 1945 400 American B-17 bombers dropped food and other supplies over the Netherlands. 6 May 1945 400 American B-17 bombers dropped food and other supplies over the Netherlands. Actually this Operation Manna was a lot bigger as it also involved lots of British and Commonwealth aircrews in Lancaster bombers.My uncle was a bomb aimer now dropping food to starving Dutch civilians. My father flew on several of these missions as a tail gunner in a B17. He told me that the missions dropped food using two bags. One bag had the food, beans or other staples inside. That bag was placed inside a larger bag and then dropped. The inside bag would break on impact. The outside bag kept the food from spreading all over the country side. When asked about the German's and how they reacted, he stated that the aircraft was flying low enough to see the crews and guns as they tracked the aircraft, but they did not shoot. On the way back to England another B17 struck the tail of the aircraft my father was in and rudder above his head. With the low water temp of the North Sea in winter bailing out was not an option. When they got back to the airbase, it took eleven tries to bring the aircraft in for a landing . On the last try they were almost out of fuel, but made it.